Parenting is a tough task today in the ever-changing world of social media and ubiquitous mobile devices. It's estimated that 91% of teens worldwide are actively texting everyday. Feelings about mobile device rules can differ greatly from one family to another and even between two parents in a household. Every family and household has their own rules about teens and texting. Depending on a child or teenager's age and maturity level, some parents choose to give their children a mobile phone with the sole purpose of the son/daughter being able to call the parent; they limit or prohibit use of social media apps, games, or other device features. Meanwhile, other parents might decide to grant permission to use more robust features of their device including messaging apps such as Snapchat, WhatsApp, or use of the built-in Messages app on an iPhone or iPad. It's a very personal decision for parents regarding what is best for their child. As most parents today know, young teens will often lobby their mom or dad to let them use the same messaging and social media apps that their friends at school are using. Most kids want to feel as "part of the crowd," with the ability to also partake in Instagram, Facebook, Twitter, or other social media platforms. For many kids, being allowed to use the Messages app on iPhone or iPad is often the first foray into the world of text messaging. Unlike Snapchat or other "self-destructing" messaging apps, many parents feel that the iOS Messages app is a good starting point since, by default, the Messages app does not automatically delete or erase text messages. Apple's Messages app is also the messaging format that most parents are familiar with and use themselves on a daily basis. As most parents know, Apple's Messages app allows iOS users to send and receive both regular text messages and iMessages. Messages sent and received in "blue chat bubble" format are iMessages where as messages sent and received with "green chat bubble" formatting are regular text messages. (You can read more about iMessage vs SMS from Apple here.) Messages app features include the ability to send photos and videos as well as the option to initiate group text message conversations. Apple's Messages app comes default with every iOS device and there is no way to delete the application from the device. 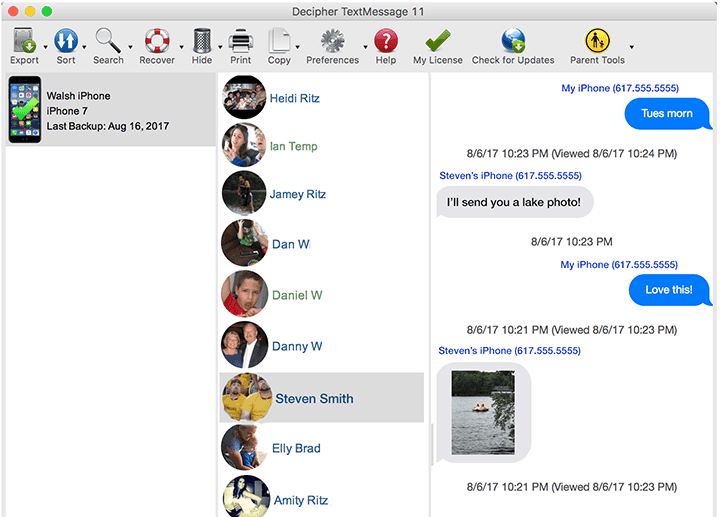 The Messages app can also be installed and used on a Mac computer, however today's focus is related the Messages app and its use on both iPhone and iPad. To avoid this scenario and also to prevent putting their child on the spot, one solution widely used by many parents for monitoring text messages is Decipher TextMessage. The desktop software provides any parent with an unobtrusive way of exporting and managing their child's text messages all from the familiar and convenient setting of their own desktop or laptop computer. Convenience - Decipher TextMessage runs on the any parent's personal Mac or Windows computer. After backing up the device via iTunes, running Decipher TextMessage will read in all of the text messages and save them on the guardian's computer. Text messages sent and received via the Messages app remain on the phone indefinitely unless the user chooses to manually delete them or sets up automatic message deletion. For many parents, part of the understanding when giving the child the freedom to send and receive iPhone text messages, is the agreement that the child will not delete any messages off their device. In cases where the parent suspects that their child is regularly deleting iPhone text messages, Decipher TextMessage offers the ability to recover whatever deleted text messages are left over in the iTunes backup and that have not been fully overwritten by Apple's iOS. In just a few simple steps, the free trial of Decipher TextMessage will show parents if there are any deleted messages contained in the iTunes backup that are retrievable. Run the free trial of Decipher TextMessage on their Mac or Windows Computer. Select a device in the left-hand column of the software. Click "Recover" in the program menu! Whether or not deleted messages are recoverable all depends on what deleted data is left over and remaining in the iPhone backup. Also if messages on your child's device were deleted before the device was backed up, then there is usually no way to recover the erased text messages or attachments. Any deleted text messages that are accessible will be presented to the user in the Decipher TextMessage recovery window which enables a parent to export the recovered deleted messages in text format to their computer. Your child finally is of age where you have decided to allow them to have their own mobile phone. Figuring out the appropriate rules to make for your kid's mobile device can be a tough decision and one that evolves and changes on a regular basis. As your child matures each year, you'll likely allow access to more applications on his or her device. For parents whose child or teen has just been given their first iPhone or iPad, having the ability to monitor their child's text messages can be the simple peace of mind that any parent needs as their kid enters into the complex and ever-changing world of social messaging and texting. Being able to view or save your child's text messages on your own computer also makes the whole process less invasive and intrusive for both parent and child. If you are a parent and you have any questions about policing or saving your child's iPhone text messages, drop us a note via our Decipher Tools support page. We're always happy to help and we respond to everyone.